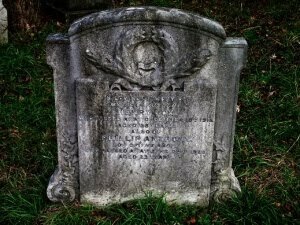 Buried in the Brockley & Ladywell Cemeteries lies Henry (or Harry) Cox (1859-1918). He was the City of London CID officer who was responsible for the surveillance of one of the Jack the Ripper suspects after the murder of Mary Jane Kelly. "The man we suspected was about five feet six inches in height, with short, black, curly hair, and he had a habit of taking late walks abroad. He occupied several shops in the East End, but from time to time he became insane, and was forced to spend a portion of his time in an asylum in Surrey." 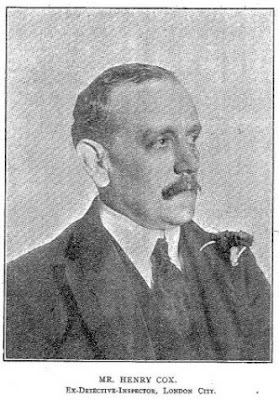 Cox wrote an account which was published in an article in Thomson's Weekly News on 1 December 1906. He was convinced that the motive was revenge on womankind, not "a lust for blood", and that the murderer, like his victims, belonged to the "lowest class". Cox comments that the crimes ceased as soon as the man was put under observation, and that he soon "removed from his usual haunts and gave up his nightly prowls". But then he adds that "not the slightest scrap of evidence" could be found against him, and that the police continued to investigate the crimes long afterwards. He concludes by saying that the crimes are as much a mystery as they were "fifteen years ago", that the theories of amateur detectives are based on nothing more than surmise, and that the murderer will be identified only if he confesses and proves himself guilty, or if he kills again and is caught red-handed. Finally he says that he has no evidence as to whether the murderer is alive or dead. By the date of his will, January 1916, Henry was living at 17 Park Road (later Waldram Park Road), Forest Hill. He died on 18 December 1918 at Charing Cross Hospital.